If you are involved in running a business and are beginning to wonder when you should start looking into branding (how does it work, anyway? ), brace yourself. 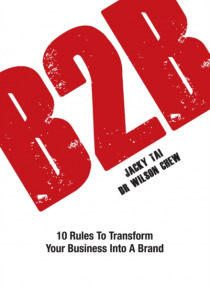 According to Jacky Tai and Wilson Chew, you should have started your branding exercise yesterday! This book distils the authors' wealth of experience in grappling with branding strategies in the real world into a practical and easy-to-unders… tand guide for everyone involved in branding.Revised from the 2007 bestseller, Transforming Your Business Into A Brand, this updated branding manual will show you just how a business becomes a brand.